DENVER — The Aerospace department at Metropolitan State University of Denver is planning to implement a new and developing technology into its curriculum: drones. 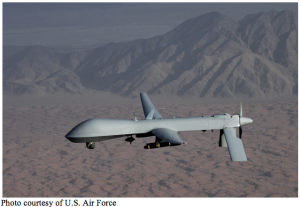 The rapidly developing technology of drones, or unmanned aviation vehicles (UAV), currently plays an important role in surveillance and warfare. They have given the U.S. military the capability to spy and attack targets without endangering human lives, and at extreme efficiency. The total drone strike attacks in Pakistan alone from 2004 to 2013 is 333, according to The Long War Journal, a website that tracks U.S. airstrikes abroad. Since 2004, the death toll for extremists in the Taliban, Al Qaeda, or their allies is at 2,485 and the civilian death toll is at 153 in 2010 there was a record of drone strikes in Pakistan, at 117. Most people are aware of the use of drones in the military, but there are a plethora of functions that drones have yet to fulfill. This technology has also been used to patrol the boarder, but, as with any type of surveillance equipment, there is a certain level of public scrutiny. Although drones have a bad reputation, their practical uses are so apparent that investment in the technology is gaining a lot of interest. 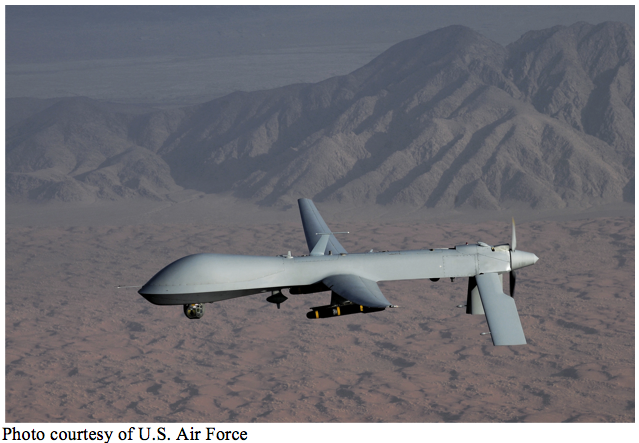 In the end, the fact that drones can save lives is unavoidable. “That’s the intended purpose—to be helpful and not to be hurtful,” Kuhlman said. In Washington, D.C., President Barack Obama’s nominee for CIA director, John O. Brennan will face a Senate confirmation and the one topic that will likely come up is drones. And yesterday, the White House leaked a memo stating that Americans who are considered terrorists can be killed abroad by drones, without due process. So, the future for this ubiquitous technology is definitely apparent, and it’s going to find itself in a lot of newspapers. Forrest plans to have UAV classes within the next two years, and he looks optimistic about the investment, for a good reason. “I think there’s going to be a time where every household will have a UAV for some use,” Forrest said. •	Unmanned aviation vehicles were first used by the Austrians in 1849. They used balloons loaded with explosives to bomb Venice. This was the first time anyone had ever used an instrument for aerial assault. •	Around WWI, scientists began to study radio-controlled pilotless aircraft. •	After years of studying and development, modern UAV technology reached a practical use level in the 1980s. •	Most famous U.S. drones are the Pegasus, with a fly-radius of 1,500 miles, and the Predator, which made its first flight in 1995. Maureen Bayne grew up in the small town Aztec, New Mexico. Later, she moved to Bakersfield, CA, where she graduated from Bakersfield High School. After attending Colorado State University for two years, she moved to Berkeley, CA, where she studied art at Berkeley Community College. She is currently living in Westminster, CO and is seeking a degree in magazine journalism at Metropolitan State University of Denver. Wow! I didn’t know about all this, really cool stuff. Well written story. Lots of intresting facts about drones! Great information! Very relevant to today’s conversations. And addresses whole other sides to drones that often seem to be left out. I was unaware that drones were going to be part of the aerospace curriculum. This is well written and very informative. Very good read, well-written. It will be interesting to see how this technology develops in the coming years. This is a very useful and informative story. The history facts at the end were really interesting. Great job! Had no idea! Didn’t know they could be used for all that.